Imants Tillers is an artist, writer, curator and AGNSW trustee. Well-known for making paintings composed of a grid of smaller, numbered canvases, he is considered a quintessentially postmodern artist in his use of appropriation and quotation. Since 1973 he has had numerous solo exhibitions in Australia, Europe and the United States and in 1986 he represented Australia at the Venice Biennale. Last year the National Gallery of Australia curated the first major survey of his paintings, entitled one world many visions. Ian Waldron first encountered Tillers’ work at university around 10 years ago and says he took inspiration from it. They met when they both exhibited at the same exhibition in Brisbane and again when Waldron was hung in last year’s Wynne Prize. When he bumped into Tillers at his recent survey show in Canberra, Waldron asked if he would sit for a portrait. Born in 1950, Waldron comes from Delta Downs in the Gulf of Carpentaria. He won the National Aboriginal and Torres Strait Islander (Telstra) Art Award (Open painting) in 1995 and has since been a finalist eight times. 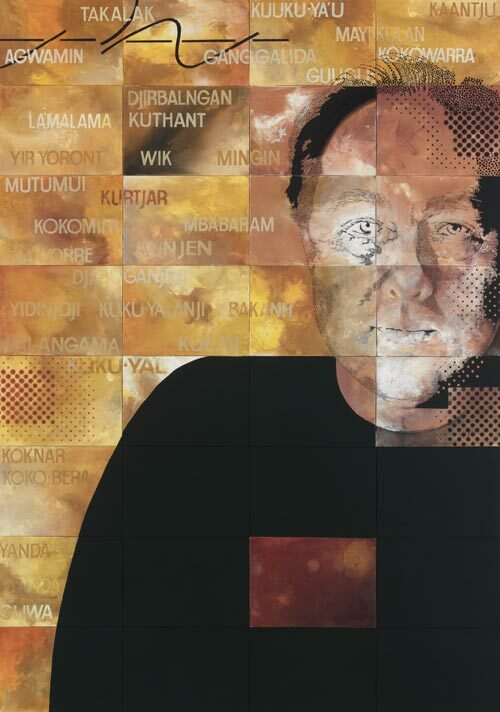 He was selected for the Telstra NATSIAA touring exhibition Celebrating 20 years in 2000. Waldron was a finalist in the 2006 Wynne Prize, the 1996 Alice Prize and the 1995 Dobell Drawing Prize. He has exhibited regularly since 2000. Exhibitions include Lingua Franca (Brisbane 2005), Spirit & vision (Vienna 2004) and From gulf to desert (Alice Springs 2003).